It has been hot in Iowa lately. It seems summer has finally made an appearance in the midwest, and for runners it has been a harsh reminder to pay attention to the elements. Kara, Doug, and I met at Raccoon River Park to get our weekend long run in. We were planning on 18 miles, and at the start everything seemed right with the world. Clear skies, calm winds, and at 7:30 am the temps were great. Raccoon River Park is a nice 3 mile loop around a lake, with a partially paved path turning into packed dirt and crushed gravel. There are some open areas, some nicely shaded areas, and a beautiful view of the lake at almost every step. We took off and our first three-mile loop was rather easy. We stopped for a quick restroom break, and headed out for the second loop. As we ran we noticed that with the suns rising, the humidity was increasing. It started to get uncomfortable quickly, but we forged ahead and got another 6 miles in before needing to stop for more water. With no wind, it started to feel like a sauna, yet me decided to go on. At mile 12, I told Kara and Doug to go on ahead, as I needed to walk a bit. I did a walk/run pattern until I was close to 15 miles. That’s when Kara, who was way ahead of me, texted saying that she was stopping at 15 miles. It was too humid to continue on. I texted back saying that I would be at our starting point in a few minutes. While it was frustrating to not get the 18 miles in, I have to remember that heat, humidity, and dew point affect runs as much as snow, sleet, and bitter cold do. We have been lucky as midwestern runners with a mild summer and almost perfect running conditions. But, as today proved, we need to understand what effects weather has on our performance. 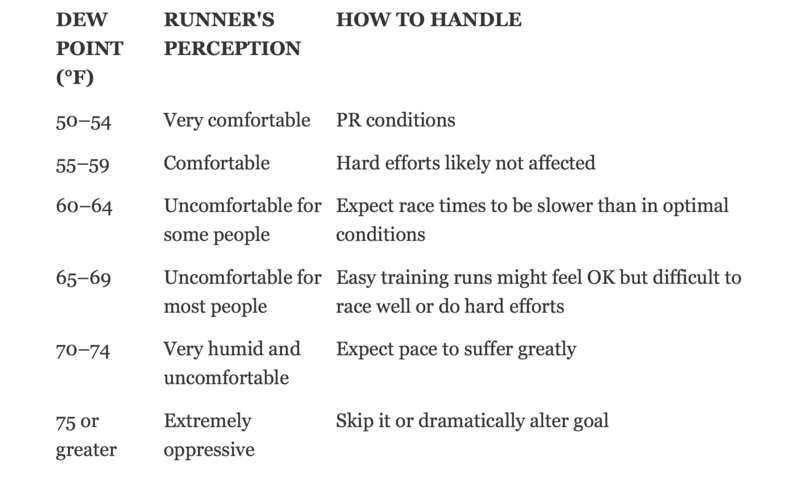 Here is a chart from Runnerworld.com that shows how the dew point affects a runner, and when we should call it a day. While we were in the ‘uncomfortable for most people’ zone, it was good that we listened to our bodies and didn’t push it. Tomorrow is another day, and we have another 6 weeks until we taper for the marathon. I think all three of us were glad to get out of the heat. Please remember to stay hydrated, and to listen to your body. The taper week is over, so it’s back to business. I have been getting the weekday runs in, and have been mixing in lap swimming with it. Who knows, maybe by next spring I will be ready for some open water training. My long run Saturday consists of a 16 mile run in the morning, followed up with a very hilly 5k in the evening. My running coach said to run the 5k as a race to train the legs to run even when tired. Last year the 5k fell on a taper week, so no big deal. This year is different. My training partner and dear friend Kara agreed to do them both with me, even though she is not fond of hills, and she thought we would do them on different days. But, as fate would have it, we get to do them both on Saturday. I’ll have to check her for weapons before the race so she doesn’t try to kill me for talking her into this. This is when memories are made. I believe I’ve said that before, and I’m betting that it will happen on Saturday as well. 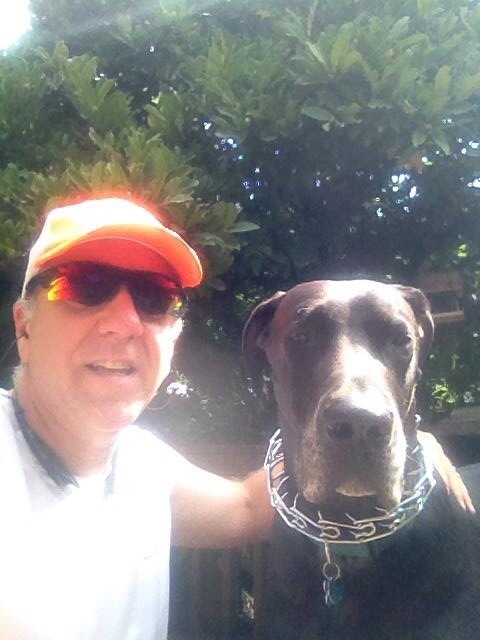 On a side note, I went on a one mile run with my buddy Murphy today for the first time (see picture). He did pretty well on his first run, he kept a good pace (10:10) and followed directions well. We will start working on distance soon. Remember: adopt, don’t shop. I have mentioned before that I am not fond of taper weeks. I’m used to pushing myself harder and harder, and then suddenly this week of almost nothing shows up. I know that the body needs time to rest, to heal, and to recover, but I guess only doing short runs and such makes me feel lazy and I worry that I will lose all the definition, along with the stamina and ability that I’ve gained, from an easy week of exercise. I know that it’s just fear of returning to my former ways, and that I won’t let that happen. Nor will my wonderful group of friends and especially my training partners who would most definitely hold me accountable. But it is a fear I have. So, this week was a taper week, and it could not have come at a better time. I caught a cold early this week, and was struggling to make it through work, let alone trying to work out. So I let the body rest and recover, and by Friday I was good to go. So much so that Saturday’s one hour easy run was just that: easy! I did accomplish something during this week. I hit the swimming pool, and tried to stop worrying about breathing and just swim. My friend and training partner Kara was there encouraging me all the way, and I got a total distance of 1050 yards in! Two of those sets were 250 yards each! The rest, with the exception of a 50 yard warm up, was 100 yard sets. As happy as I was with my workout, I was more impressed with Kara’s. She swam a mile for the first time, and she made it look easy. I think she would have swam all day if she could! I can’t describe what a wonderful friend, mentor, workout partner, and person Kara is. She swims a mile for the first time, but makes a big deal out of my accomplishment. What an awesome lady. This week we crank up the miles, and the long runs hit the 16-20 mile range. We have already hit 18 miles, and I bet Kara will shoot for 20 this Saturday. Then that evening, we have a very hilly 5k that I talked Kara into running with me. She may try to drown me the next time we are in the pool. But as I have said before, this is where memories are made. An Amazing 18.3 Mile Run! Saturday was an amazing day to say the least. Our running team, The iCan Running Group, met at 7:00 a.m. to head out on a three hour, fifteen minute run. It was going to be the longest run so far in terms of time, and my hope was that it would be the longest in terms of distance as well. If it was not longer, I was concerned that the people we are mentoring would see this as a setback. I try to remind them, and everyone for that matter, that we have good runs, and not so good runs. Diet, nutrition, attitude, stressors, all play a part in whether or not a run is as successful as you want it to be. And sometimes, the body just needs a rest and you don’t perform to your expectations. But even with that knowledge, it’s hard not to become frustrated when you run a longer time and get less or the same miles in. We met up at Coach Loran’s gym, and started off with a hilly six-mile route which actually looped back to the gym. We stopped to top off our water bottles, and then my dear friend Kara, and my buddy Doug (who I am mentoring) took off for the bike trails to complete our timed run. It was a wonderful morning, cool and slightly overcast, and the trail was somewhat clear. As we progressed, the bicyclists and fellow runners started coming out. We laughed and joked along the way, with one self-appointed “trail police” bicyclist catching most of the jabs. And our picking on Doug was almost endless. The poor guy brought along Honey Stinger Waffles to fuel up with. I use them as well, but usually carry the Honey Stinger Chews. But I let it be known that when we talked to the group, I was going to say how everything was going well until Doug had to stop for waffles! We were coming up on the end of our run, and while waiting at a light, I asked Kara and Doug what their longest distances were. Kara was at 17 miles and Doug was at 16.75. We were almost to both! As Doug crossed the 17 mile threshold, my Garmin beeped and I gave him a big high five. For a guy who has had breathing issues, dizzy spells, and IT issues, he keeps plugging away and gaining ground. While others would quit, I think it makes him all the more determined to do it. Kara is an amazing soul! To tell me she was struggling during the first part was a shock to me, as she makes it look so very easy. If I didn’t know her and didn’t run myself, and saw her running by, I would think to myself, “Oh I could do that”. That’s how easy she makes it appear. But I know how hard it is, and I know that I don’t give off the appearance of making it look easy. She is steady, focused, and glides along as if she could go on forever. I really admire that. We were back at the gym’s parking lot a little early, but I figured with two distance records set, we could break a little early. 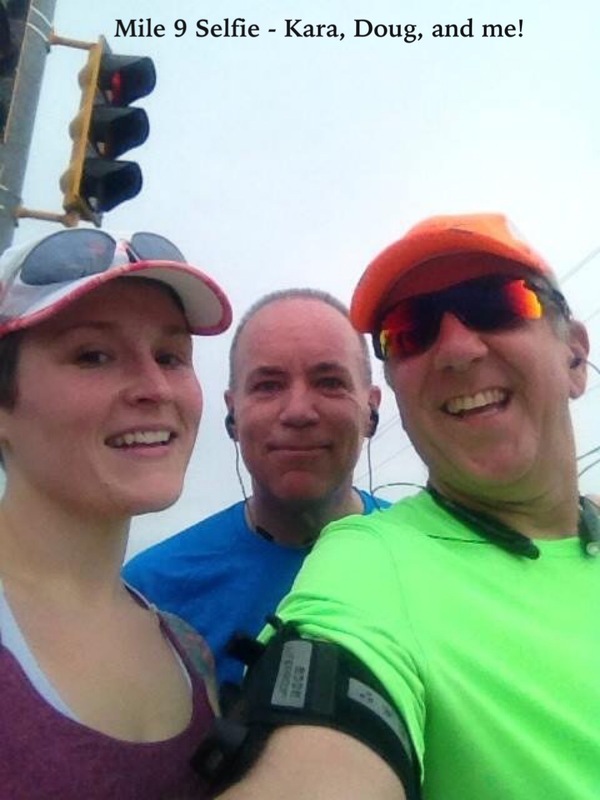 We finished the training run in 3:06:58 with a total of 18.3 miles and an average pace of 10:12 min/mile. What an awesome job out of both Kara and Doug! I am so proud of them. I am also quite blessed. Throughout this transformation I’ve been going through, I have come to see and be a part of many amazing things. From 5k’s, 10k’s, half and full marathons, bike rides, triathlons, and other events, it has been quite a journey. Now added to the mix is mentoring and assisting others as they start their journeys, or continue to expand their journey. To say I am blessed to be a part of it is an understatement, but I’m at a loss of words to describe the joy I feel. On this amazing Saturday, I woke up, had some breakfast, and thought “I’m going to help someone run for three hours.” How awesome is that? To be able to not only do that yourself, but to partake in the joy of helping someone else be able to do that too? Truly a blessing. Thank you one and all for allowing me to enjoy the blessing of being with you on your journeys. The Longer The Run . 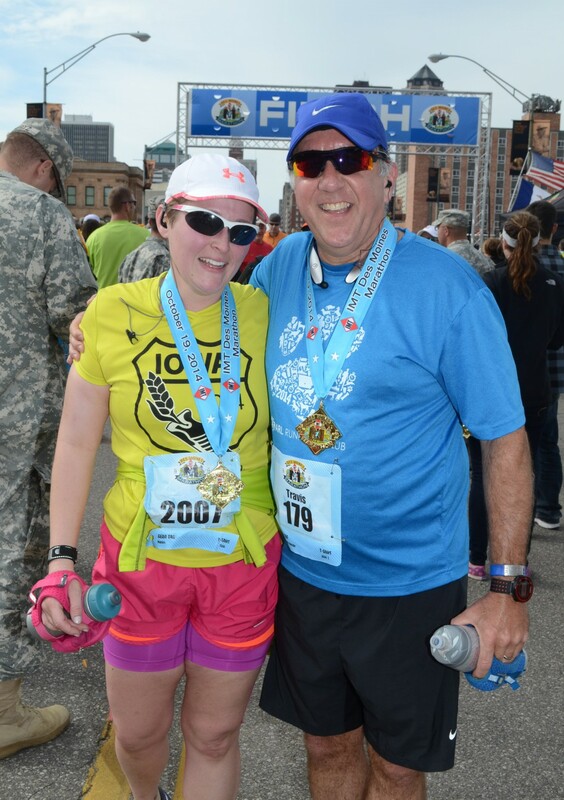 . .
We are approaching that time in the marathon training process where the long runs are getting to what some people call “ridiculously long”. Runners, on the other hand, see it as a challenge to overcome. But, as the miles increase, the kinks in your training armor start to show and can lead you down the road to injury or failure if you’re not careful and take the necessary precautions. Our running group is starting to see the effects of this, as some of our members are struggling through injuries. Most times, injuries can be contributed to either lack of stretching, or poor form. Both of these are essential for a successful run, and especially when you run long distances. Saturday, our group was scheduled to run three hours. I met Chuck at the park, and after stretching, we took off on our run. We were the only ones there. After a couple of miles, we had to make a quick pit stop, and when we resumed running we found Doug on the trail. He had gotten to the park a little late, and was going to run alone. But as fate would have it, we “ran” into each other and the trio was set. As we ran, I wondered why there was a lack of members at the start. I know that it’s summer, and there are plenty of family activities to keep oneself busy, but marathon training seldom takes a break. While it’s better to be undertrained that overtrained, it still helps to know that you can complete most of the distance without too much of a struggle. I would not want to walk up to the start of a marathon having only run 15 miles as my longest run. Chuck and Doug did a great job with their runs, and we finished just a little early at 2:48:39. We went a distance of 15.75 miles! We averaged 10:04 per mile. I thought that was pretty good, and going into next weeks run where it’s 3:15, I’m thinking that the magical 20 mile run is getting close. If they continue at this pace, it will be time to do a pre-marathon route run so they can get a feel for what will be waiting for them in October. I know a few other runners in our group are doing well, but they had to run on other days so they could meet commitments. I also know that a few are fighting injuries, but it seems a few are missing. I hope they haven’t given up, because it’s pretty awesome to cross that finish line and forever be called a marathoner. But that comes at a price; you have to dedicate yourself to the training, or the finish line will never come. I hope this was just a bad week, and that everyone is ready to go again next weekend. Because if not, the kinks in the armor will show up pretty quickly, and no one wants that. I cannot stress enough how essential it is to stretch to warm up the muscles before a run, and to stretch after a run. Foam rollers, and even ice baths are a runners friend, even if it feels exactly the opposite! It helps to prevent injuries, and helps the body recover quicker. Trust me, I hate cold baths, but I take one after a long run. I also have a love/hate relationship with my foam roller. It is a necessary evil, if you will, but one that helps me recover from the abuse I put my body through, and prepare it for the next round. And the next round of long runs is coming! I can’t wait! !